Whale watching from Washington has never been better! Since our very first tour in 1996, Island Adventures has had some truly spectacular encounters on the water, but we can easily say, without hesitation, that whale watching has never been more exciting than it has been in the last few years! An abundance of seals and sea lions has led to an orca baby boom, with nearly 80 calves born to the mammal-eating orca community since 2012! Humpback whales we first saw years ago as calves are now returning with babies of their own, and several new gray whales have joined the familiar “Sounders” at local feeding grounds. There’s never been more diversity in the Salish Sea and we are so thrilled to share these exciting trends with our guests in 2019! At Island Adventures, we pride ourselves on being the most experienced and dedicated whale watching company in Washington. It's not a fluke that our tour has been voted the best in the Northwest for years. Island Adventures holds the industry's highest orca sighting success rate and was one of the first and only companies to guarantee whale sightings on every tour. Our team of highly qualified crew will make your trip unforgettable! We boast more than 100 years of combined experience and have led thousands excursions for hundreds of thousands of satisfied guests over the last 22 years. Experience counts! No matter where you are in Washington, we have the tour for you. Our locations are strategically placed to offer the best whale viewing opportunities. There's no company that sees more whales than Island Adventures. As members of the Pacific Whale Watch Association, we share a proprietary online sightings network and private encrypted fleet radio channel between other whale watch companies. If there are whales in the area, we know it. High-speed, low profile vessels often travel past whales without seeing them. Our elevated wheelhouses and upper decks allow us to find more whales, spot them sooner, and view them better than smaller boats. Anacortes is our flagship location where Island Adventures first began back in 1996. Just a 90-mile drive from downtown Seattle, Anacortes is a convenient starting point for your wildlife adventure - no ferry required! The calm waters near the San Juan Islands are one of the best places in the world to view wild orcas. Humpback whales, minke whales, and gray whales also call the region home. Soak in the natural beauty of the Pacific Northwest aboard the finest whale watching vessel on the entire west coast, the Island Explorer 5. Our Everett tours are the greatest whale watching value in the state. While it’s always possible to see orcas, humpbacks, or minke whales on this tour, our main focus are the gray whales that return to the protected waters of Puget Sound each spring. Everett is just minutes away from the rich gray whale feeding grounds, allowing us to spend more time viewing these gentle giants. Our naturalists will teach you to identify individual whales that have returned to this area for decades. In addition to whales, this wildlife-packed tour also sees harbor seals, sea lions, porpoise, eagles, osprey, and a variety of seabirds. Only 30 minutes from Seattle! Port Angeles is a premier whale watching destination located just outside the popular Olympic National Park. In recent years, the surrounding waters have become one of the leading destinations for viewing humpback whales in North America. Both salmon-eating and mammal-eating orcas are often spotted here as well. From Port Angeles, the comfortable Island Explorer 3 can head west into the Strait of Juan de Fuca, east toward the San Juan Islands, or north to Race Rocks Ecological Preserve, a memorable spot we visit more than any other U.S. company. Best location for guests coming from Tacoma and the Olympic Peninsula! From private charters to our annual Fourth of July Fireworks cruise, Island Adventures offers more than just guaranteed whale watching tours. Check below to see what's available! We'll take care of the details on your next family, company, or crew outing. Island Adventures is known as the area's premier whale watching company, but we also offer private charters throughout the year. The Island Explorer 4 and Island Explorer 5 feature full walk around lower decks, upper viewing decks, great sound systems, heated cabins, galley service, his and her restrooms, and the best crew in the area. Whether it is a whale watching tour, wedding, corporate team building event, or a family reunion, give us a call and we will help you set up an event your guests will never forget. You've seen fireworks from your lawn chair or picnic blanket, but have you ever been on the water to celebrate USA's birthday? At Island Adventures, we're offering a special 4th of July wildlife and fireworks cruise out of Anacortes and Port Angeles. These 2.5 hour tours will depart at 8:30 PM in search of wildlife before sunset, then we'll position ourselves for a front-row view of the fireworks display. Our full menus will be available and features Ivar's clam chowder, Nathan's hot dogs, nachos, beer, wine, and more! Beat the crowd and enjoy the 4th on the water! See when we're running tours, and how full the boat is! Our state-of-the-art online booking system makes it easy to make reservations anywhere, at any time. You'll receive an immediate email confirmation with a receipt, driving directions, and a satellite image of the location you booked. Reservations are highly recommended, but we'll gladly take walk-ups if space is available. Reservation system never sleeps – book a tour anytime from anywhere! Our boats were specifically built for whale watching. Our goal is to show you as many whales as possible, and with our fleet of specifically designed whale watch vessels, we do that better than any other company. To ensure comfort and quality, we don't book our vessels to full capacity. Every passenger has unobstructed front-row viewing. You won't be stuck inside looking through glass or forced to stand behind other guests. Due to the design and stability of our vessels, we don’t force you to to sit down while we’re underway. Grab a hot Ivar’s clam chowder or a cold local brew while moving freely around our fully walk-around viewing decks. When you’d like to sit, however, we have plenty of options for everyone. All of our vessels have comfortable indoor heated cabins and outdoor, wind-protected areas with padded seating. No other vessel comes close to the comfort of the Island Explorer fleet. Some of the features that set us apart from the pack are things you’ll never see. Our vessels are equipped with large, low-noise propellers and above-water exhaust to create a quiter experience for the whales. While watching whales, our vessels make less noise than the ambient sound of rain hitting the surface. We’ve modernized our vessels by investing in equipment that not only meets but exceeds current emissions standards. We guarantee whales on every whale watching tour. If you do not see a whale (orca, minke, gray, or humpback) with us, you can come again for FREE, for life, on any tour until you do. This is not a gimmick — it is a passion to show our guests whales. Notice there is no fine print and this is not a standby pass or a discounted ticket. Just give us a call, and your next tour is on us. It’s that simple. Sighting Success Rate: Over 97% since 1996. Our Whale Report shows a detailed account from every tour. We rarely miss! Where do we see whales? We've integrated SPOT satellite technology to upload the precise GPS coordinates of the day's sightings to an interactive map on our website. As you'll see from the map, whales don't live in one spot. In fact, whales travel more than 100 miles in a 24 hour period! The Island Explorer fleet has the largest range in the area with the highest whale sighting success rate. It's a common misconception that small boats get closer to whales. Each vessel – regardless of size – is required to adhere to state and federal whale viewing laws. Large boats offer more stability, comfort, and added amenities (real bathrooms, onboard cafés, and much more). Our spacious vessels with multiple viewing decks offer an unparalleled photography platform that small boats simply cannot offer. Our daily Whale Report is the most comprehensive record of whale sightings by a whale watch company in the industry. Every day, our professional naturalists record an account of the day and upload images. Check it out –– the Whale Report dates back to 2007! 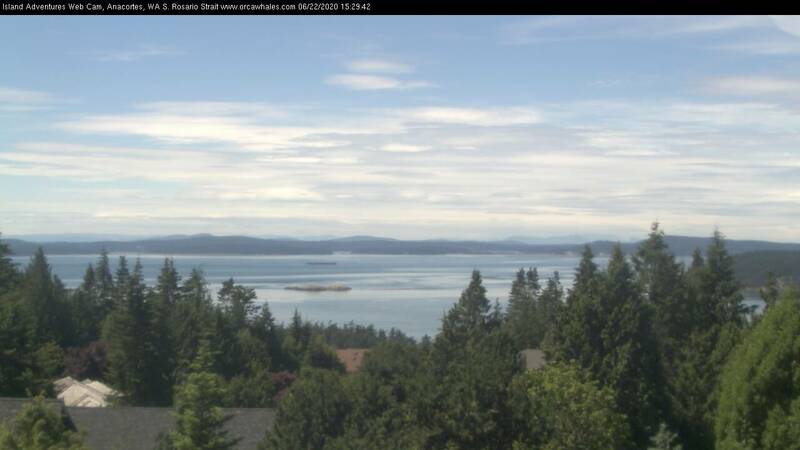 Island Adventures’ webcam is overlooking south Rosario Strait, gazing west toward the San Juan Islands from Fidalgo Island (Anacortes). These waters, located 90 miles inland from the open Pacific Ocean, are considered to be one of the best whale viewing territories in the world. Our goal is to share as much local wildlife, scenery, and history as possible on each and every tour.